It really seems as if the muses have chosen Solomeo as their home, almost like a small second Periclean Athens. The Theatre, Academy, and Amphitheatre, like the buildings standing on the Acropolis, are sacred places of the arts protected by the muses. The Villa Solomei Festival is one of its most beautiful music events. Today the Festival plays a major role in the popularization of classical music of the highest level. 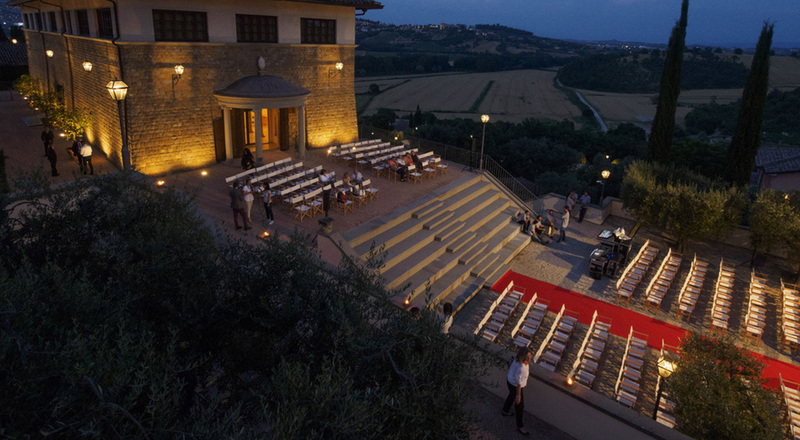 The aim of the Villa Solomei Festival is totally consistent with Brunello Cucinelli's humanistic ideals. With its success increasing year by year, it clearly demonstrates the benefits of popularizing art forms capable of fostering sensitivity to beauty above and beyond the boundaries of strict tradition. One of its intents is to be able to bring back the musical milieu of the 19th century, when the most passionate opera fans were the common people; in fact it was they who, from their seats in the theatres' "peanut galleries", decided the success or failure of a production, probably with a greater sincerity than that of the critics and with an expertise no less refined. The "Villa Solomei Festival" is dedicated to the memory of Father Alberto Seri, the revered parish priest of Solomeo and founder of the "Coro Canticum Novum", who passed away on 24th August 1997.